When visiting the beautiful state of Utah, you’re never short on exciting things to do with hundreds of hiking and biking trails, unique geological formations, and expansive national parks. While planning your trip itinerary, be sure to research some of the unique annual events in Southern Utah. When you request a copy of our complimentary Vacation Guide, you can cut your planning time in half! This handy planner is filled with local suggestions on activities, restaurants, attractions, and more. 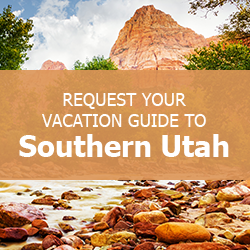 Familiarize yourself with the area and map out which sights you’d like to see during your stay, plus learn more about the many Southern Utah events that take place each year. Countless travelers have already used this guide to plan their perfect vacation. Get your copy today! A weekend-long event, the Bryce Canyon Winter Festival takes place each year in February. Celebrating the many winter activities practiced in the region, this festival offers dozens of demos, clinics, and other activities including ski archery and snowshoe tours. Try a new sport or participate in an event you love! Each year, the four-day Panguitch Quilt Walk honors the traditional art of quilting while supporting a charity that helps young girls in developing countries. Be sure to check the festival schedule to learn about all the exciting events that take place. Quilters will love participating in the trunk show, quilting classes, quilt show, and vendors stalls. A favorite part of the festivities, the tractor and vintage car parade happens on Saturday before the quilt walk races. Hosted each summer in the Bryce Canyon National Park, this festival is an exciting event for amateur astronomers and outer space enthusiasts–even the kids will love attending! Events will be held both during the day and night. Bring the kids to the Bryce Canyon Astronomy Festival for the daytime activities including model rocket ship building and daytime telescope gazing. At night, come back to the canyon for some of the most amazing stargazing through high-powered telescopes with the help and expertise of astronomers. Watch as dozens of colorful hot air balloons take to the skies at the annual Panguitch Utah Balloon Festival. Over the course of one weekend, you can watch the biker parade, participate in the balloon rally bingo, take a ride on an inflatable, and listen to live music. To celebrate one of the most notable playwrights in history, Cedar City, UT, hosts an ongoing festival with different classic Shakespeare plays performed throughout the town. The Shakespeare Festival in Cedar City attracts more than 110,000 people to the area each year with 16 weeks of shows, events, and outdoor activities. One of the best ways to see Southern Utah’s natural beauty is to attend the Cedar Breaks Wildflower Festival in Cedar City. Head to the Visitor’s Center at the Cedar Breaks National Monument to embark on a guided hiking tour led by experienced rangers who will point out types of wildflowers and provide photography tips on how to capture the area. A playwright, a comedy, and a cultural icon, Neil Simon and his work are commemorated each year in Cedar City at the Neil Simon Festival. Throughout the summer, attend performances of Simon’s classic work. For ten days, artists from across the area will take over locations in Bryce Canyon National Park and Capitol Reef National Park during the Escalante Canyons Arts Festival. Learn from talented artists during demonstrations, lectures, and workshops, then take a unique souvenir home from one of the many vendors or the arts and crafts fair. Held among towering red rock formations, the Zion Canyon Music Festival takes place each year at the O.C. Tanner Amphitheater in Zion National Park. For two days, bands will take the stage at this stunning venue. Throughout the event, you can also indulge in delicious food, peruse unique artwork, and hang out in the beer garden. The Cedar Livestock and Heritage Festival commemorates Cedar City’s long and important agricultural history. Over the course of four days, you can witness demos and showcases like the Antique Tractor and Machinery Show or the Dennis Stowell Memorial Ranch Rodeo, as well as livestock events including farm dog herding competitions and the biggest event of the festival–the Sheep Parade. A family-friendly event, the Red Rock Film Festival brings independent and professional movie makers to the big screen in this annual competition. Purchase tickets for individual screenings, like the documentary feature competition or fiction feature competition, or buy a package for the entire festival. No matter which Southern Utah event you decide to attend, you’ll want a comfortable place to stay close to the festivities. Family Time Vacation Rentals offer properties in several areas of Southern Utah not far from each of these festivals. Whether you’re traveling with a large group of friends or as a family, we have the perfect property for you! Browse our complete collection of available properties and start planning your getaway today! We can’t wait to help make your trip unforgettable.